Ray Galton says: "Please buy this book, it's filthy." Alan Simpson says: "An invaluable book for ambitious, intelligent young men, seeking a dazzling new career - guaranteed £7 a week at the age of 35." 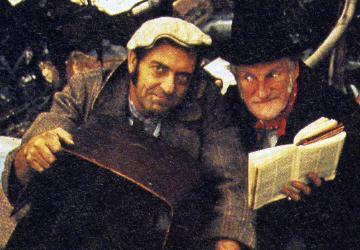 To the firm of Steptoe and Son, Scrap Merchants, have come fame and nationwide affection. Their unique place in the gallery of British comic characters is secure. The ceaseless struggle between the obstinate invincibly possessive Albert and the long-suffering Harold - ever poised for flight but doomed to share a life of frustration with Dad - has become part of the national scene. Their robust humour may be broader than it is long, but pathos and humanity also have their places in these down-to-earth, hilariously funny tales. One August day in 1951 there arrived in my office the script of a humorous sketch, badly typed on (as I learnt later) a borrowed machine. It amused me so much that I sent a telegram to the authors' address in South London, asking them to come to see me. ...except that I have my doubts about Steptoe. I grew up listening to my dad's reel-to-reel tapes of British comedy and, while Hancock was always my favourite, Steptoe had a place in my affections as well. But now I find the TV shows almost unwatchable, and the radio shows hard going as well. The writing is superb, and the acting was tremendous, but - be honest - it's not really funny anymore, is it? And in the absence of laughs, it becomes horribly depressing. Galton & Simpson were probably the most intelligent writers in the history of British sitcom, but in Steptoe they veered off into the territory of modern drama: the sheer misery of Harold's inability to leave home is the stuff of Pinter or Beckett. And it's just as miserable here.